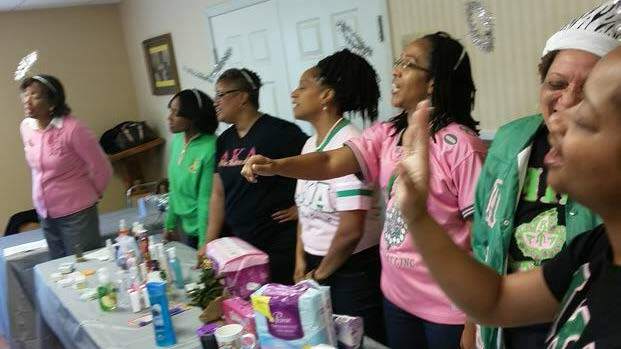 Members of Chi Upsilon Omega Chapter of Alpha Kappa Alpha Sorority, Inc. showed up in great numbers to Miracle Village for Santas for Seniors. Members of Chi Upsilon Omega Chapter of Alpha Kappa Alpha Sorority, Inc. singing Christmas Carols. 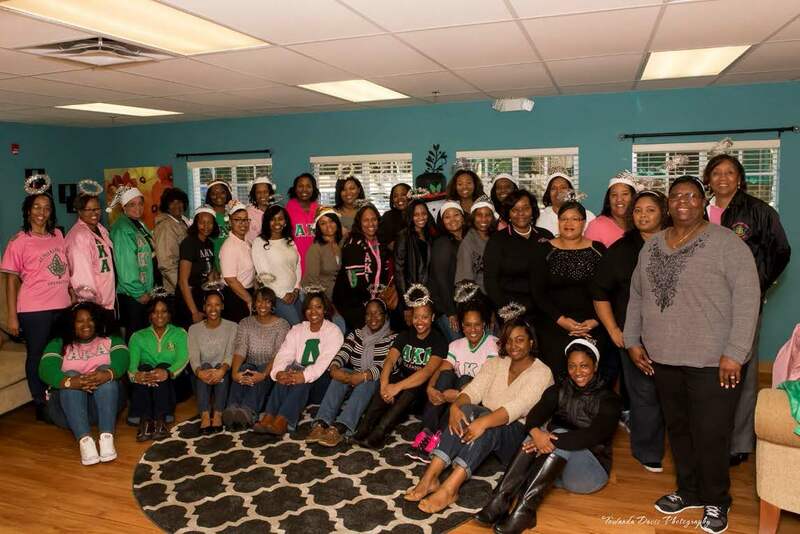 Members of Chi Upsilon Omega Chapter of Alpha Kappa Alpha Sorority, Inc. and residents of Miracle Village after a round of Bingo. The Community Room at Miracle Village Independent Living Facility was filled to capacity Saturday morning, Dec. 19 as the residents eagerly awaited the start of Santas for Seniors, an event hosted by Chi Upsilon Omega Chapter of Alpha Kappa Alpha Sorority, Incorporated. Once the members of the Chi Upsilon Omega Chapter arrived to the facility, they put their commitment to community service into action and engaged the residents with arts and crafts, music, gift giving, and some intense and very competitive rounds of bingo. Santas for Seniors was hosted open-heartedly to provide the residents of Miracle Village with holiday cheer and to provide them with household items, toiletries and other necessities. 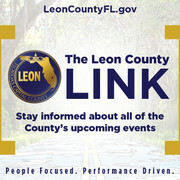 The event opened up with a lively game of bingo, followed by ornament decorating, raffle giveaways, sing-a-long Christmas carols, some more bingo, and gift presentations. 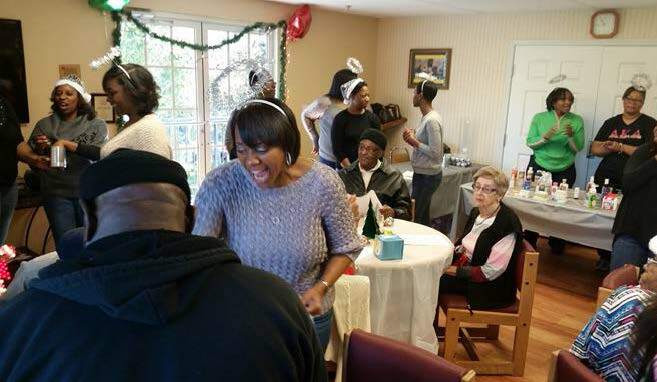 A few residents of Miracle Village even showcased their talents by singing some of their favorite Christmas tunes. “It was a good opportunity for the chapter to come together with seniors in our community,” said Marilyn Henderson Hudson, incoming president of the chapter. “It was an opportunity for us to get to know them, do some quality activities with them, and also to let them know that we haven’t forgotten about them,” Hudson said. 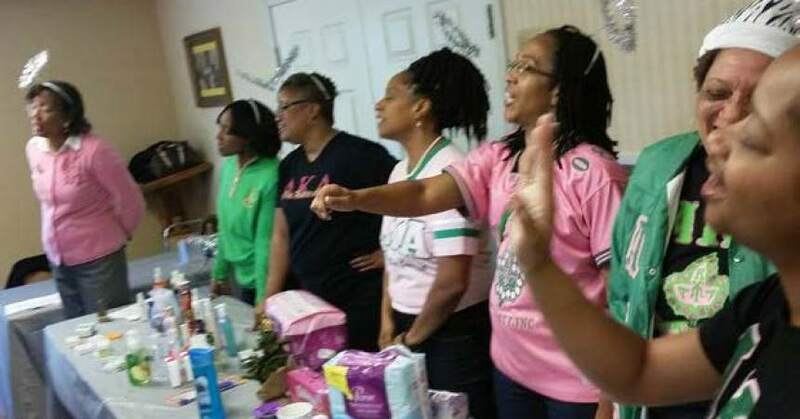 The members of Chi Upsilon Omega Chapter of Alpha Kappa Alpha Sorority, Incorporated experienced holiday joy themselves as they interacted with the residents through singing, sharing hugs, and the exchanging of smiles. The chapter plans to continue their outreach to Miracle Village Independent Living, Incorporated as it correlates with the sorority’s Family Strengthening Target.